The enemy of screw and barrel efficiency is wear and Tear. Screw wear is a result of the flow of plastic against the screw and barrel as well as metal contact between the flights and barrel evens some lots of engineering plastic lead a important role for wear of screw and barrel. Hard facing alloys are normally welded or on the top of the flights instead of the root and side of the flight. In extreme wear conditions, such as fiberglass fillers in processing, etc., welding of the roots and sides of feed and first transition can be justified. The top of the flight of a screw is exposed to metal to metal rubbing contact with the barrel. Therefore, the integrity of hard facing alloy to the base of the flight is very important. This is why spraying metals, chrome or nickel plating at the top of the flight is not recommended and is seldom done. Hard facing alloy are always welded to from a “metallurgical bond” rather than “Mechanical bond”. Here are some of the commonly used hard facing alloys. Stellite 6: Stellite 6 has excellent resistance to many forms of mechanical and chemical degradation over a wide temperature range. Stellite 6 has outstanding anti-galling quality. It can retain hardness at higher temperatures. Because of cobalt content it is corrosion resistant too. Stellite 12: Stellite 12 is very smiliar to Stellite 6, but has more tungsten in its composition providing a higher degree of hardness and better abrasion resistance. As a result, this material is preferred over Stellite 6. Colmonoy 56: Colmonoy 56 is a nickel base alloy with chromium boride crystals. The chromium boride crystal provides the hardness qualities to Colmonoy 56. Manufacturing of chromium boride is done by Wall Colmonoy through a proprietary process. Colmonoy 56 resists wear, heat corrosion and galling. The material has good ductility. However, deposits of No. 56 should not be applied to base metals, which will subsequently be hardened or tempered. Colmonoy 56 can be welded by TIG, Oxyacetylene and Plasma Transferred methods. You will find that all the good hard face alloy are compounded to give the least amount of surface cracks, but these cracks can not be 100% eliminiated. The harder the alloy, the more cracks one will find. 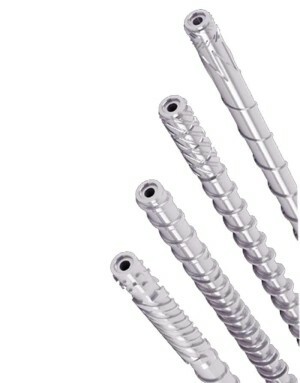 Another reason for cracks in rebuilt screws is due to the fatigue set into the base material over time causing cracks. These cracks then propagate all the way to top. Putting a stainless steel layer before hard facing curbs this problems. These types of cracks will continue from the base material of the flight and sometimes all the way to the root. Also, such cracks are a lot wider than hard surface material cracks. It is generally more economical to discard screws up to 2″ DIA with fatigue cracks than it is to rebuild them. Depending upon hard facing materials, cracks are almost not visible by naked eye as much as .002″ are common. Contrary to general thought, a hard surfaced screw with no cracks is not better than one with cracks. A smooth or no crack surface generally means there has been too much dilution of the base material with the hard surface alloy and hence a poor wear surface.